One of the best horse books of all time! In 1938, a year of monumental turmoil, the number one news maker wasn't Franklin Roosevelt or Adolf Hitler. It wasn't even a person. It was an undersized, crooked-legged racehorse owned by a bicycle repairman-turned auto mobile magnate, trained by a virtually mute mustang breaker, and ridden by a half-blind failed prizefighter. 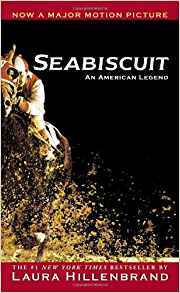 I haven't actually read this book--YET!--but I've read "Come on Seabiscuit" by Ralph Moody and I loved it! I can't wait to get this book from the library! I'm reading this. So far, so good! I had to read this for my English class. I absolutely loved it! I would recommend it to any horse lover. omg i like this book! it has soooooo much expression about a horse that was forgotten and then was loved and made it to victory! i think it's pretty good!